"Although they prefer to come out of the cage on a perch rather than on your finger (mostly because they like to come out together), they step up from their playpen. They love to eat anything from your hands. They`re curious, happy, and love to take baths and be out of the cage. Sky still chews his legs when his collar is off although the veterinarian can`t find any reason, so he needs a little extra care. His collar can be off when under supervision. He seems to chew more when nervous, so maybe with time, he can fly free and collarless. Beautiful Ginger is healthy, cheerful, and her favorite pastimes are chewing toys and preening Sky. She is eager to bond and will follow when you leave the room...especially if Sky is with you!" We are Sky and Ginger. 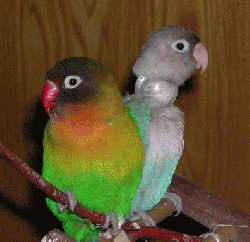 Though we are known as Black Masked lovebirds, we aren`t partners in crime. We`re partners in being adorable. We`re not very old and have been together most of our lives. From humble beginnings, we were passed from home to home by people who didn`t want us or couldn`t care for us properly. Recently we lived in a horrible makeshift rabbit cage that didn`t even close properly. The day our rescuer came to pick us up, Sky was lost because he squeezed out when our owner left us outside. Fortunately he was found the next morning. Our rescuer swept us away to a wonderful home where we enjoyed a huge indoor aviary with toys and our own "pool" (or bath). We listened to soft rock music every day. Our rescuer Mommy cooed and loved us and sometimes let us fly around the house as long as we didn`t chew up her paintings. In our 8 months in that home, we learned what the good life is. But then Sky began to get itchy sores on his legs. Our Mom couldn?t manage the expensive vet bills while still caring for her four other birds, so she took us to Mickaboo where we got the required vet care. Now Sky is healed and we`re ready to look for a new home. We were hand raised and don`t bite, but we have forgotten how to sit on fingers. Sky comes a bit closer to that when he lands on a human arm or leg. With some patient guidance, we might remember that hands are fine things. In the meantime, we would love for you to talk baby talk to us. Can you provide the home where we will finally have everything we need? If so, then maybe YOU need two bundles of feathered fun.